Lucca is situated not far from the Italian Riviera and the Mediterranean Sea. Lucca is a lovely Tuscan town with Gothic, Renaissance and Romanesque architecture and an intact ancient city wall. The historical city center (Centro Storico) is surrounded by ancient walls. Many streets in Lucca are walkways for pedestrians and bikes. It is very nice to explore Lucca on a bike. Lucca features a beautiful dome (Duomo di San Martino), marvelous piazzas, narrow historical streets, small boutiques, restaurants and wine shops. With its romantic and peacefull warm atmosphere Lucca stands for the serene Tuscan pace of life and is the perfect location for a warm and romantic destination wedding in Italy. A civil wedding in Lucca can be held in the ancient Palazzo Orsetti. Decorated with beautiful antique frescoes and furniture civil wedding ceremonies will be held in the beautiful “Sala Verde” (Green hall). The majestic hall in the beautiful Palazzo Orsetti is the perfect frame for unforgettable civil weddings in Lucca. There are many marvelous ancient private villas around the city of Lucca. These gorgeous private homes used to be the summer residence of noble families and nowadays are often the elegant event venue for weddings, family- and corporate events. Several of these villas obtained the right to perform legally binding civil wedding ceremonies on the grounds of the property – either in beautiful Italian gardens surrounding the villa or in frescoed antique halls. Couples from all over the world have the possibility to celebrate their civil wedding and an elegant wedding reception in a private historical villa or an Italian garden in the countryside around Lucca. Many of these villas over the possibility to rent rooms to stay for several days before and after the wedding in the private villa. On the properties of private marvellous villas in the countryside around Lucca can be performed civil, protestant and symbolic weddings. 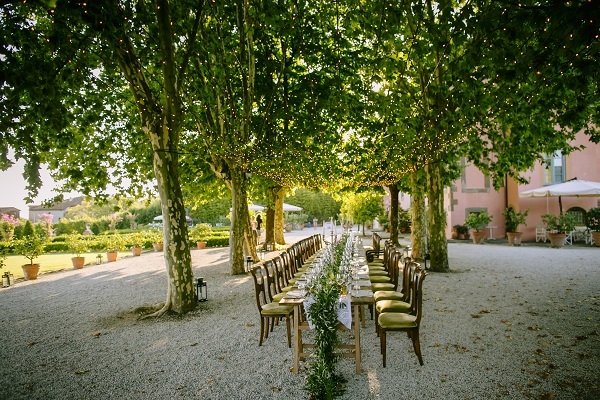 Looking for a wedding planner in Lucca and Tuscany? Please contact us for an unconditional free offer!